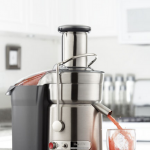 Breville 800JEXL Juice Fountain Elite juicer is the perfect companion for people who need to extract juices of several fruits and vegetables for daily healthy intake. It is also very helpful for those who want to enjoy good beverages in a reasonable amount of time minus the risks brought about by instant powdered mixes. Do you want to benefit from the goodness of fresh fruit juice but don’t have the time to prepare it? Do you want to spend more time with your family and serve them something healthy with no difficulties in time management? 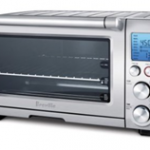 Do you want to have a full-functioning appliance that also serves aesthetically in the kitchen? If you answer YES to these questions, Breville 800JEXL Juice Fountain Elite juicer is definitely for you. Maximizes juice extraction. For sure you don’t want to spend money on a juicer that doesn’t deliver what it promises to do. This Juice Fountain guarantees to give you all the extracts it can possibly take out from anything you feed it, be it leafy greens which can be tricky to do. Powerful at 1 Kilowatt (1000 Watts). The amount of energy it uses is justified by the efficiency of this juice extractor. Preparation time is minimized so you get to have more time to spend on other things. Dual Speed Settings. This is how fast the sharp blade spins to separate the juice from the pulp. For hard fruits or vegetables like carrots and apples, you can use the 13,000 RPM. For soft ones like bananas, you will only need half the speed. You can choose the 6,500 RPM. Wide feed tube. At three inches in diameter, the chute where you put in the fruits can accommodate three regular-sized ones. This contributes to the product’s efficient factor because you don’t need to cut or slice before feeding into the tube. Instead of repeating the same process twice or more, with Breville 800JEXL Juice Fountain Elite, you can do it just once. Beautifully encased in stainless steel. Despite its size, this will certainly look good on a kitchen counter. With its beauty comes durability which does not usually occur nowadays. 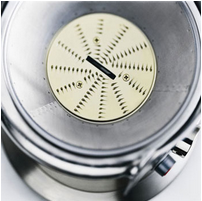 The micromesh filter is also of stainless steel and the cutting disk is titanium-plated. 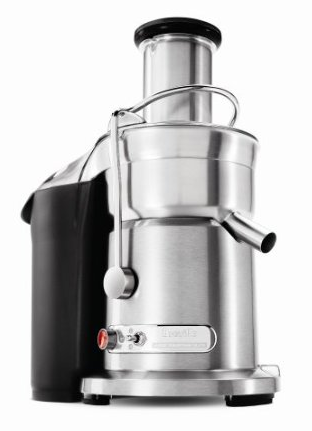 As established, the Breville 800JEXL Juice Fountain Elite is not small. It is 17 inches in height, 11 inches wide and 20 inches in diameter. Because it is almost 20 pounds, it doesn’t come across as very portable. However, this size is needed as it can collect up to a liter of juice and about 3 liters of pulp in one go. The juicer comes with a manual which is very easy to follow, a recipe book which can come quite handy, the juicing pitcher conveniently at 1.1 quarts and a separate juice jug that can separate froth. In the box will also be a 3-liter pulp container, a food pusher which you can insert or feed the produce safely with and a cleaning brush that you can use to clean the wire mesh and the cutting disc. As a consumer, it’s natural to ask “What does Breville 800JEXL Juice Fountain Elite have that gives it an edge over other juicers?” You don’t want to spend more cash on something if you can actually get it at a lesser price. Breville 800JEXL is very easy to operate! With or without the user’s manual that comes with it, operating this juice fountain is stress-free. It saves you the hassle of slicing produce during preparation time. With its wide feed chute, you can insert whole fruits. This decreases the risk of knife-related injuries. Cleaning does not take much time. 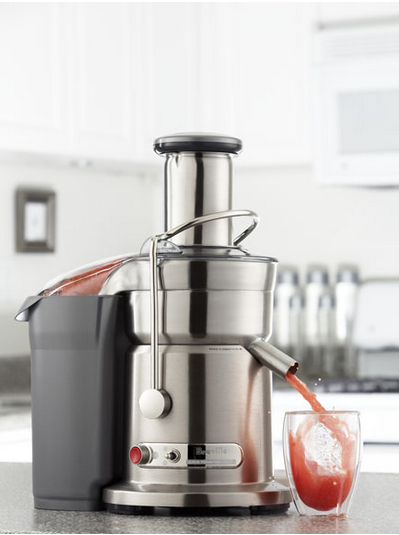 With the juicer’s stainless steel design, you won’t be hesitant to wash it. As long as you don’t dip the whole juicer in water, it’s fine. At times when washing is not necessary, you just need to wipe it with a damp or dry cloth. The parts are all dishwasher safe. It is easy to assemble and disassemble this Breville juicer. The parts fit in a regular- sized dishwasher. So you just arrange them and push that button. Retains more natural vitamins in the juice. Because this product does not require a lot of heat during the process, the health goodness of the beverage stays. It protects itself from overload. It has a button specially designed for overload protection, so it’s one of the safest you can find. Each buyer has specific expectations in mind and when these are not met by the product, they fall under the list of downsides. Breville juicer 800JEXL is not very portable. Due to its size and weight, it is not advisable for the product to be moved around a lot. However, if one does not mind carrying it with them then this is not a problem. While the product has no problems extracting juices from hard fruits, it may be a bit tricky for it to exhibit the same performance in the case of green leafy vegetables like wheatgrass. It is not impossible, but there is a series of steps listed down in the user guide in juicing leafy greens. During operation, it is not very quiet. It doesn’t produce an ear-shattering noise, but there are people who think it should be quieter. Before buying anything it is wise to check what present owners have got to say about the product you are about to purchase. Delivers what it promises. It produces juice in the least amount of time. Most people who have tried Breville juicer 800 are satisfied with its efficiency. Motor worry. Because it is heavy duty, many of the consumers are concerned about its motor durability. However, of its 5 years in different households, there have been no noticeable complaints about a broken motor. User friendly. The product is very easy to operate. The stress-free operation gives the consumers no choice but to give it a thumbs-up. 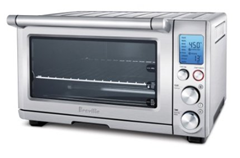 With less than $300, you can have Breville juicer 800 for just $299.99. 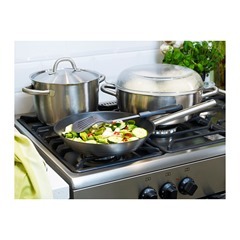 For those men and women who love to spend time in their kitchens and cook, it is the convenient countertop appliances that will become the best helpers in the kitchen. Zojirushi is commonly associated with some of the best countertop appliance products currently available on the market. One of the latest products they offer is the Zojirushi CV-DSC40 VE Hybrid Water Boiler. Just like all other Zojirushi products, this Zojirushi CV-DSC40 Water Boiler and Warmer provides a simple function yet much convenience when it comes to keeping water hot. Its micro-computerized temperature-controlled system and multiple settings to keep water warm ensure that users continue to have hot water whenever they need it. While its design is conventional and will make anyone think it is just like any other water boiler on the market for a kitchen, its high-tech features will make it stand out from all competitors. Double Insulation Bodyis uniquely designed to maintain the current temperature of the water for a much longer time without the use of additional electricity. This makes the vacuum-electric (VE) hybrid hot water boiler much more energy efficient as it does not require the continual use of electricity to keep the water warm. Zojirushi CV-DSC40 VE Hybrid Water Boiler and Warmer, Stainless Steelcomes with three keep warm temperature settings – 175 degrees Fahrenheit, 195 degrees Fahrenheit, and 208 degrees Fahrenheit. This allows individuals to choose at what temperature they would like to keep their water hot at. The sound indicators on the Zojirushi CV-DSC40 VE Hybrid Water Boiler and Warmer, Stainless Steel lets users know when the boiling process of the water is completed or if there is a low water level inside the boiler. This takes out the guess work when wondering if water is ready or if more water needs to be added to the Zojirushi CV-DSC40 VE Hybrid Water Boiler and Warmer, Stainless Steel. If a user needs water to boil at a specific time, for example, just before they get home from work so they have hot water waiting for a relaxing post-work cup of tea, they can set the timer on the Zojirushi CV-DSC40 VE Hybrid Water Boiler and Warmer, Stainless Steel to start the water boiling before they get home. The timer can be set up to six to eight hours in advance. There is also an automatic shut off for when the water is done boiling, so there is no need to worry about electrical appliances running much longer then they need to. With the micro computerized temperature control system on the Zojirushi CV-DSC40 VE Hybrid Water Boiler and Warmer, Stainless Steel provides information regarding the current temperature of the water at all times. This system also enables users to set the temperature and then control it. There is no fussing with knobs and buttons and no guesswork on how hot the temperature of the water really is as the control system will continually provide that information. The stainless steel exterior of the Zojirushi CV-DSC40 VE Hybrid Water Boiler and Warmer, Stainless Steel makes it extremely easy to clean at all time. There are no worries about stain. And because stainless steel is extremely durable, if the Zojirushi CV-DSC40 VE Hybrid Water Boiler and Warmer, Stainless Steel somehow drops to the ground, it will not easily break like ceramic and plastic hot water boilers tend to do. 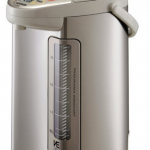 The product dimensions of the Zojirushi CV-DSC40 VE Hybrid Water Boiler and Warmer, Stainless Steel are 8 x 11 x 14 inches and weighing in at nine pounds. Currently the Zojirushi CV-DSC40 VE Hybrid Water Boiler and Warmer, Stainless Steel does not come with any accessories. The stainless steel body on the Zojirushi CV-DSC40 VE Hybrid Water Boiler and Warmer, Stainless Steel means that it is easy to clean without much trouble. The Zojirushi CV-DSC40 VE Hybrid Water Boiler and Warmer, Stainless Steel is extremely durable and offers multiple functionalities to the user. It can last for many years and still functions the same as when the user first bought it. It is virtually maintenance free. The Zojirushi CV-DSC40 VE Hybrid Water Boiler and Warmer, Stainless Steel is extremely convenient when hot water is needed immediately, either for making a hot cup of tea, boiling water for the stove, or any other use for boiling water. Comes with a Café Drop dispensing mode to allow for slower dispensing of water, for example, if needing hot water for measuring purposes. There is a control panel that will continually display the current water temperature. The Zojirushi CV-DSC40 VE Hybrid Water Boiler and Warmer, Stainless Steel comes with a three foot power cord. Like with any other water boiler, it will need to be descaled on a regular basis, which can be a bit of a chore. Some users have stated that the temperature change between the preset temperatures are not as fast as some people would like. The Zojirushi CV-DSC40 VE Hybrid Water Boiler and Warmer, Stainless Steel is a bit pricier than some of the other water boilers available on the market. Many consumers enjoy using the Zojirushi CV-DSC40 VE Hybrid Water Boiler and Warmer, Stainless Steel. Amazon has listed the Zojirushi CV-DSC40 VE Hybrid Water Boiler and Warmer, Stainless Steel as number two in their ranking of top hot pots because of the large number of customers satisfied with this product. The current price of the Zojirushi CV-DSC40 VE Hybrid Water Boiler and Warmer, Stainless Steel is listed at more than 30 percent off of the original price. We LOVE Kinder Bueno Chocolate!! 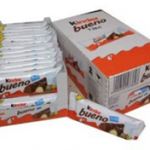 Kinder Bueno is a German chocolate brand, which stands for “Children Tasty” in English. If you like chocolate, this is something you must try! The think we love about this chocolate is its delicious hazlelnut cream filled treat surrounded in rich decadent milk chocolate. We first learned this brand in an online forum where a lot of people highly recoomended it. However, we visited Target, Albertsons, and other grocery stores, and we never found it. We finally found it in a local Korean store, which was totally to our surprise. We never thought we could find a German chocolate bar in a Korean store. If you know Ferrero, then Kinder Bueno is a sub-brand of Ferrero. 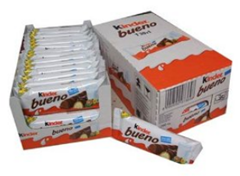 Kinder Bueno is very famous in Europe, but we do not find any main grocery store carrying them. After we finished our first Kinder Bueno bar, we started to search online and decided to purchase a box. Yes, A BOX! You can say we were crazy, but we really missed its taste. My wife and I particularly love chocolate bars with any nuts inside, and Kinder Bueno really fulfills our taste desire! It is really additive. Milk chocolate covered wafer with smooth milky and hazelnut filling, what can you expect more? 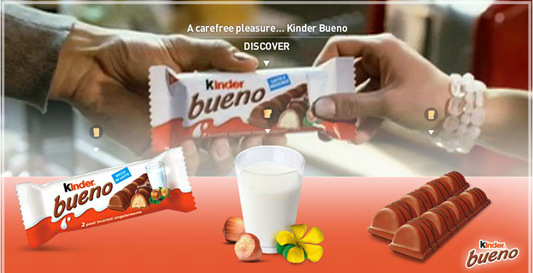 Kinder Bueno becames our top chocolate choice and I strongly belive that Kinder Bueno will not let you down. The only downside is that the one you can get on Amazon requires shipping fee. Howver, it is still way cheaper than the one we can get in the local Korean store, which was 3 bars for 8 dollars! That was totally a rip-off! This Kinder Bueno box is 30 pc for less than 35 bucks, which was one third of the price we could get at the local store. On top of it, the shipping is fast and chocolate bars come in a good condition. Give Kinder Bueno a try and you will never regret it!